Once you get into Ambrette Town, Serena comes by to tell you to visit the Fossil Lab. 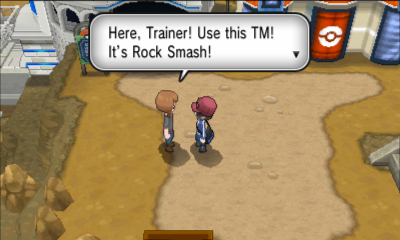 Go down the steps and talk to the girl standing outside of the Pokemon Center for TM94 Rock Smash. If you follow the trail behind the right of the Pokemon Center, you'll get to a Heart Scale. 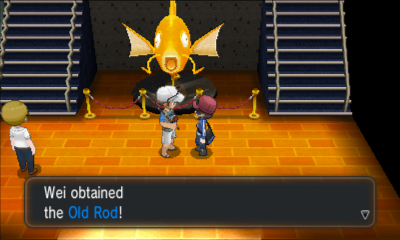 Inside the Ambrette Aquarium, talk to the guy in front of the Magikarp statue to get an Old Rod. Now you can fish for Water-type Pokemon to catch! Go south to find a guy asking to trade a PokeBall for his Dive Ball. Go to Hotel Ambrette in the southern part of Ambrette Town to obtain TM96 Nature Power from a girl. Upstairs, talk to Dr. Bonding to get to use Sp. Def Power Lv. 1. The Fossil Lab is at the southeastern part of town. Go inside, to the right, and Serena will join you in chatting with two scientists. They suggest you visit Glittering Cave. Go outside and east into the entrance. Inside the gateway, talk to the girl standing by the table to receive a Rocky Helmet. Proceed east to Route 9. 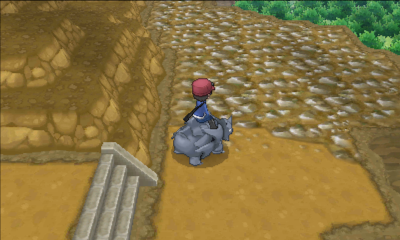 To move through Route 9, you must ride the Rhyhorn, so hop on. As you approach the big boulders, press "A" to have Rhyhorn smash it. Smash the first two boulders to pick up a X Defense. The next item is a Paralyze Heal. Follow the narrow trail to the right to pick up a Fire Stone. There's a fork in the road near the entrance to Glittering Cave. Smash the boulders and get off Rhyhorn to go on foot for a bit. Pick up the Dusk Ball. If you have Flying-type Pokemon, you can have a Sky Battle with a trainer there. 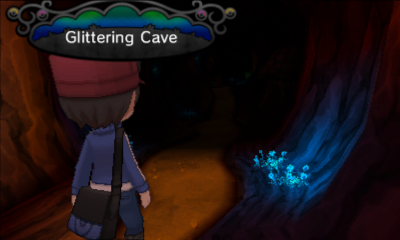 Finally, go into Glittering Cave. Glittering Cave is a really dark cave with crystals that provide some lighting. You'll come across dark patches which turn out to be wild Pokemon. Inside, you'll find a Hard Stone and TM65 Shadow Claw. 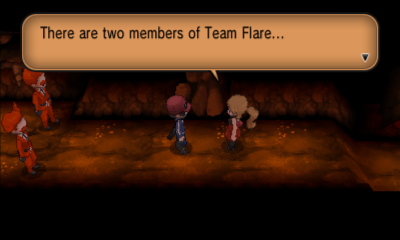 Deep inside the cave, you'll bump into a member of Team Flare. It looks like these guys are up to no good. If you answer "No" to his question, he'll battle you. After defeating him, he'll let you pass. Follow the trail. You'll battle another Team Flare member. Go north, use Rock Smash to break the rock at the corner, and pick up a Revive. Go west. 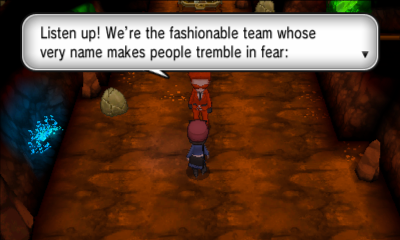 There are two more members of Team Flare up ahead who notice you. Serena comes by to join you in a two-on-two battle against them. Continue down the path. Near the end, you can pick up an Escape Rope, handy for getting out of this cave. 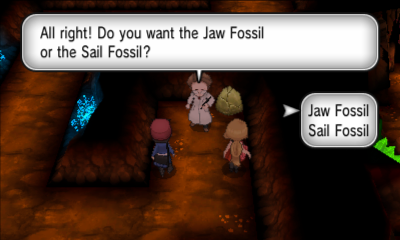 At the end is a scientist who has just found two fossils and will give you one of them: either the Jaw Fossil or the Sail Fossil, which turn into Tyrunt or Amaura, respectively. The scientist will give the other to Serena. 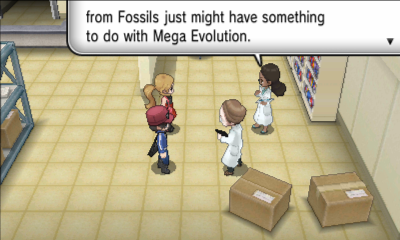 Afterwards, use an Escape Rope to get out of the cave and head back to the Fossil Lab. Now make your way through the Ambrette Aquarium onto Route 8. The second part of Route 8 is on a beach. Head south all the way to pick up a Pearl. Head northwest to pick up a Mago Berry. When you head north, a girl will give you the Dowsing Machine, which is used to find hidden items. If you smash a rock blocking access to a sign, you'll find a Heart Scale. Very soon, you'll arrive at Cyllage City.